This silky, ultra-hydrating formula protects the delicate skin around your eyes. It visibly reduces fine lines and puffiness and heals your skin. This restorative blend delivers high concentrations of essential fatty acids, vital nutrients and bioflavoniods that are essential in the repair and rejuvenation of delicate tissue. Gently pat a small amount around the eye area morning and evening. Allow to absorb. Organic Aloe barbadensis Leaf Juice, Simmondsia chinensis (Jojoba Oil), Capryil/Capric Triglyceride, Glycerin, Cetearyl Alcohol, Tocophersols ( Vitamin E), Glyceryl Stearale, Prunus armeniaca (Apricot Kernal Oil), Theobroma cacao (Cocoa Seed Butter), Butyrospermun parkii (Shea Butter), Triticum vulgare (Wheat Germ Oil), Rosmarinus officinalis (Rosemary Leaf Extract), Xanthan gum, Caprylyl Gltcol, Lecithin, Benzy; Alcohol, Dehydroacetic Acid, Lactic Acid, Organic Oils of Oenothera biennis (Evening Primrose Oil), Rosa mosqueta (Rose Hip Seed), (Carrot Seed), Persea americana (Avocado Oil), Centella asiatica, (Gotu Kola), Arnica montana, Euphrasia, (Eyebright Flower), Ecinacea fresh root, and pure Essential Oils of Chamomilla recutita (Chamomile), Lavadula angustifolia (Lavender), and Jasminium grandiflorum (Jasmine). Carrot Seed Essential Oil — The healing properties of this oil stimulate the regeneration of new skin cells, thereby adding elasticity to the skin. Chamomile Essential Oil — Used in skin care for centuries due to its purifying and soothing qualities, Chamomile is excellent for tissue regeneration. It will immediately rejuvenate tired and puffy eyes. Jasmine Essential Oil — Derived from the Persian word “Yasmin” which means fragrance flower, this sweet, romantic fragrance comes from flowers which bloom at night. Jasmine has long been found to nourish and protect the skin. It is held in high regard for the treatment of dry, sensitive skin and for wrinkles. 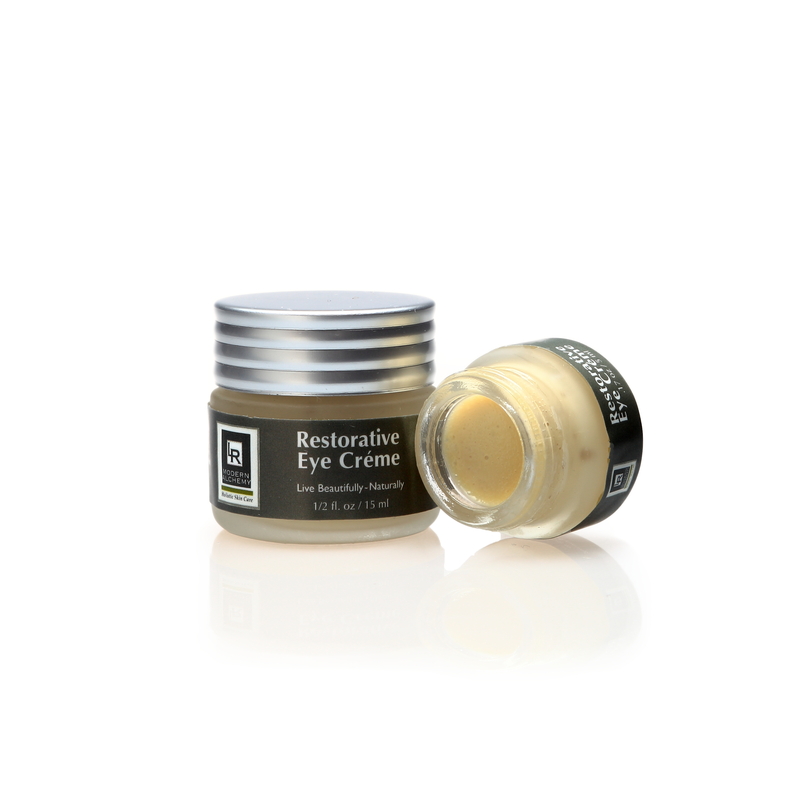 it reduces the bags under my eyes and feels restorative to the skin around my eyes. Wow!! I have searched for the right Eye Creme and I have finally found it!!! I can apply Morning and Night wear it in combination with my concealer or just completely alone. The result i have seen is so wonderful. The thin sensitive skin under my eyes has become softer to touch and appearance. I can apply to entire eye area, the lids of my eyes have firmed and made a soft smooth appearance as well. Wearing eye shadow now is Beautiful and does not crease into my lid. I can also wear this product alone and provides a Beautiful soft sheen to the skin around my eyes without applying any concealers etc. I Love the Restorative Eye Creme and never again will use anything else !! !